Your average hard shell kayak that seats two will cost you hundreds of dollars. Not to mention that it can be incredibly difficult to maneuver, especially during a long fishing trip and it’s more prone to tipping over when you’re trying to navigate it to a fishing hot spot. If a traditional hard shell model is just not in your budget, or you simply need a kayak that’s lightweight, easy to store and transport, and a breeze to use out on the water, you can take a look at this model by Sevylor. This is a budget-friendly option that seemed to really surprise consumers when it came to versatility and overall durability. If you don’t have much experience kayaking, the idea of an inflatable model may seem like a poor choice, but the manufacturer has really outdone themselves in terms of designing an inflatable model that has a lot more to offer kayakers on a budget. 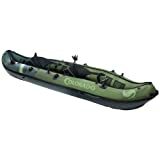 The Coleman Colorado is an inflatable kayak that features a rugged design. Made from eighteen gauge PVC with a 1000D tarpaulin bottom, it will allow you to reach those out-of-the-way fishing spots without the fear of a puncture. There is also an 840D nylon cover that will provide added protection from punctures in the event you crash into obstacles. This model also features the patented Air System which is guaranteed not to leak, while the multiple air chambers allow the riders to stay afloat in the event of a puncture. The Sevylor Coleman Colorado kayak is designed to accommodate two adult riders and has a weight limit of up to 470 pounds. With seats that are highly adjustable, two users can ride in comfort and style. Consumers can choose to paddle to their destination or use the trolling motor on this inflatable model. When switching to the motor function, the angler can place the paddles in the paddle holders to keep them safe, secure, and out of the way. Users can also enjoy hands-free fishing, which is owed to the quick-set rod holders. When it comes to storage, you’ll find large mesh pockets that are perfect for storing all your supplies, while the D rings that have been added will allow you to attach extra equipment. On the other hand, the built-in carry handles will let you pull the kayak in or out of the water easily. Additionally, the lightweight design and free carry bag will make transporting the kayak simple. With help from a dual-action pump that has a pressure gauge, it takes only about ten minutes to deflate or inflate this kayak. However, some consumers had issues with the valves, which look similar to what you would find on an inflatable mattress, so just take precaution when setting up and packing the kayak. The Sevylor Coleman Colorado is a great two-person inflatable kayak that is flush with sought-after features for an incredibly reasonable price, making it great for all levels of kayak fishing enthusiasts. Its durable 18-gauge PVC construction coupled with a 1000D tarpaulin bottom provides a rugged craft that is significantly less susceptible to punctures; its multiple air chamber design also aids that. Not only filled with some of the handiest features such as paddle holders, adjustable seats, and storage pockets, but you’ll also find a host of extra properties. These will include a guaranteed airtight system to prevent any possible leakages; Berkley quick-set rod holders that are fully adjustable and allow the occupants to sit back and relax while fishing; and even trolling motor fittings for those looking to add a bit more speed to their trip. It’s also NMMA certified up to a weight of 470 pounds and is warrantied by the manufacturer for 12 months. Paddle over calm waters or take advantage of the trolling motor and reach those out-of-the-way fishing holes in no time while enjoying the highly adjustable and comfortable seats and appreciating hands-free angling. For those who love everything about Sevylor but are a bit more budget conscious, it might be worth taking to look at the Tahiti model. You still get high-quality craft construction with 21-gauge PVC, multiple air chamber design, and NMMA certification but only up to 360 pounds. Although it also has adjustable seats, they are somewhat uncomfortable when compared to the seats installed in the Coleman Colorado model. Definitely, with its lower price, you will lose out on many of the extra features and get a reduced manufacturer’s warranty. On the other hand, if you’re looking to try something new and have a higher budget available, then the Brooklyn BKC UH-TK181 is a choice you might want to consider. Brooklyn Kayak Company are renowned for the quality of their builds, offering kayaks that are not only extremely functional but can also take a lot of beating. The UH-TK181 comes with three articulated and four flush-mounted fishing rod holders, conveniently located waterproof storage hatches to keep your valuables in, and a secure bungee rear cargo area where you can secure extra gear. Some things to note is that at such a high price, you’ll only get a one-year warranty, and it only has a maximum weight capacity of 440 pounds, which is lower than the Coleman Colorado model. This Sevylor Coleman Colorado Two-Person Kayak allows you to enjoy a day out on the water with a companion and make it back home in time for dinner. This inflatable kayak proves to be both sturdy and durable, and it offers the versatility to hold one or two riders and a ton of gear and all without compromising the kayak’s maneuverability. The option to use a trolling motor with this model adds a whole new experience to fishing on a kayak. It’s also nice to be able to easily store this model in the trunk of a car and take it out for spur-of-the-moment fishing activities. Overall, this is a good choice for anglers and water sports enthusiasts of all skill levels who are tight on budget.